The Virgo experiment has already done four scientific runs : VSR1 (may - october 2007), VSR2 (july 2009 - january 2010), VSR3 (july - october 2010) , et VSR4 (june - october 2011), with a sensitivity allowing to detect some gravitational waves sources as far as 12 Mpc (about 40 millions light-years). The three first scientific runs were done in coincidence with the two american LIGO detectors. 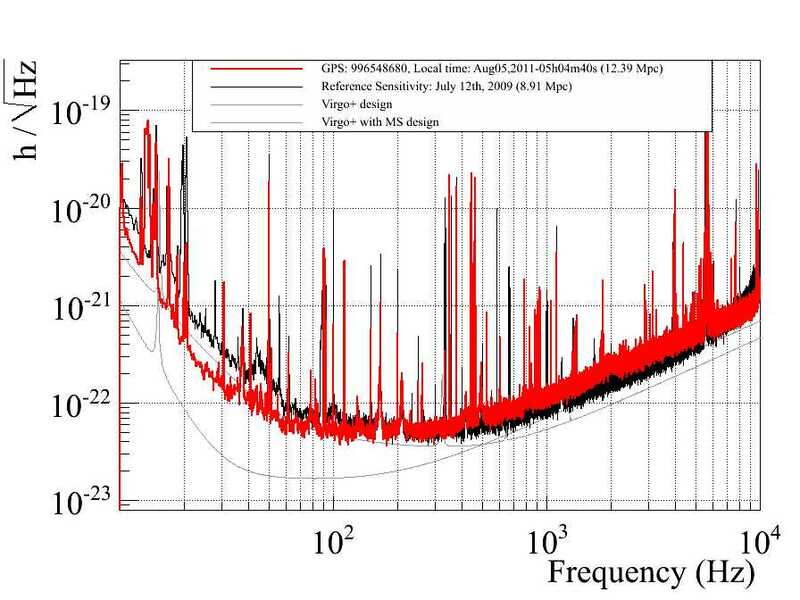 The common data analyses LIGO-Virgo of those data did not find any gravitational wave candidate. A more sensitive detector, Advanced Virgo, is currently under installation and should take first data in the year 2017, in coincidence with the detectors Advanced LIGO (scientific runs O2 and O3). Advanced LIGO has already done a first scientific run from September 2015 to January 2016 and the common LIGO-Virgo analysis of those data has provided the first detection of a gravitational wave. This gravitation wave was coming from the coalescence of two massive black holes, 1.3 billion light-years from the earth.